Whether you are looking for a quiet country inn near the beach or on a lake, rustic lodge or a full service resort, there are many great weekend getaways in Michigan. Popular Michigan weekend destinations include Mackinac Island, Traverse City, Holland, Frankenmuth, Lansing, Ann Arbor and Grand Rapids. 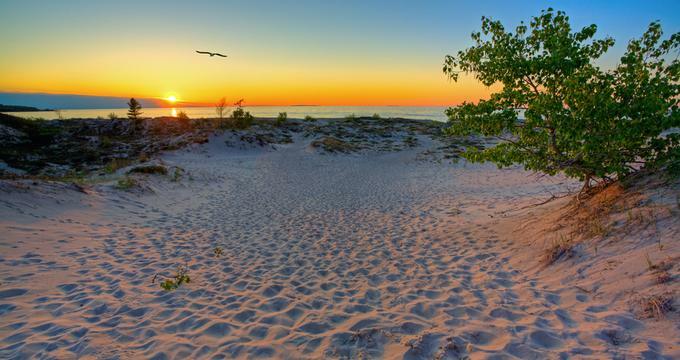 Here are some of the top romantic getaways in Michigan. Castle in the Country is one of the best romantic getaways in Michigan, offering elegant decor, modern amenities and breathtaking natural views. The romantic bed and breakfast inn sits on 65 quiet, rolling acres perfect for finding a spot to enjoy your loved one’s company. There are 10 rooms and suites that have fireplaces, whirlpool tubs, private baths, and Wi-Fi. 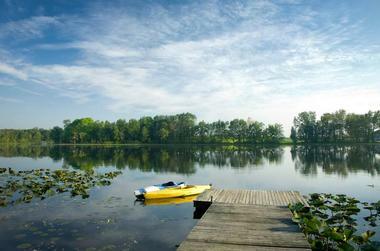 As a guest you may spend the day with your significant other on the private lake or by the pond. There is a free paddle boat for those who wish to use it, kayak rentals and snowshoes in the winter. For a romantic outing, walk along the trails, or sit on the porch or gazebo. The Royal Retreat Spa is within the Castle Keep and only available to guests. Rooms start at $149 per night. The Bavarian Inn Lodge in downtown Frankenmuth offers a taste of Germany in the middle of the United States. There are 360 guest rooms, including 46 with king beds and 24 with whirlpools. 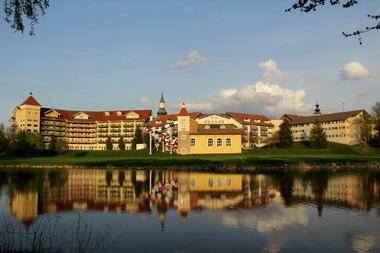 The Bavarian Inn Lodge has three whirlpools, four indoor pools, two water slides, and an indoor water park. There are also 13 acres of beautiful riverfront property to explore. Alternatively, you may take a romantic ride in a horse-drawn carriage. The Marv Herzog Hotel is right in the middle of Frankenmuth for easy access to Bavarian traditions and German heritage in a friendly atmosphere. There are 38 rooms, each of which is reminiscent of an alpine lodge to kindle romance or simply help ensure a memorable trip. Each room is decorated uniquely and has a microwave, coffee maker, and refrigerator, while certain rooms have Jacuzzis and balconies for views of the town. During your stay, have a drink in the Bier Garten on the riverside patio. To complete the feeling of being transported, you will notice memorabilia throughout the hotel. A complimentary breakfast is included with every stay, including eggs, biscuits, sausage, Belgian waffles and cereal. There is also coffee available all day, wireless internet, and beer, wine, and snacks available in the evening. When you want to make some memories, leave the hotel and visit Frankenmuth for traditional Bavarian foods and gifts as well as gorgeous tourist attractions. Rooms start at $108 per night. The Historic Webster House was the history Bay City home of Civil War veteran Thomas E. Webster. Visitors can enjoy period architecture and furnishings combined with modern amenities. There are a total of 7 guest rooms for couples to choose from, each of which has a private bath. For added romance, opt for a room with a Jacuzzi or skylight. You will also notice fireplaces in the rooms, flat screen TVs, and free Wi-Fi. The Spa and Sauna allows for privacy, massages, wine, and relaxation in the Jacuzzi, as well as couple’s side-by-side massages and reflexology. Throughout the building, you will find multiple parlors that are comfortable and elegant, with the Eastlake fireplace being a popular destination. Antique furniture and custom draperies add to the decor. Every guest receives a complimentary gourmet breakfast, has access to complimentary beverages and an icemaker, and can attend the nightly wine and cheese reception. If you are looking for affordable Michigan getaways near Detroit, rooms start at $100. Chateau Chantal in Traverse City is a picturesque romantic getaway complete with a vineyard, local beaches, breathtaking views, and history. The 11 rooms range from spacious suites to cozy spaces and have high ceilings, elegant furniture, a wet bar, a whirlpool tub, and balconies with great views. At the inn, you will find sitting areas, fireplaces, and large breakfasts. Since there is a winery on site, no visit to Chateau Chantal is complete without a visit to the tasting room. You can also go on a tour of the winery or book a private tour at your convenience. For the best experience, schedule a VIP Winery Tour & Island Room Experience, which can cater to your exact needs and preferences. There are also Food & Wine Pairing Tours with sit-down tastings and 5-bite pairings. In addition, you may attend a wine education dinner. Consider attending a wine boot camp as a couple for an experience you will remember forever. Rooms start at $165. The Munro House Bed and Breakfast in Jonesville is located in a historic building which is not only the oldest house in Hillside County, but was also the first brick building. There are a total of seven guest rooms, each of which is unique. Some include a gas fireplace and/or a jacuzzi tub that fits two people, making them ideal for couples on a romantic getaway. The period feel of the building is complemented by wireless internet, cable TV, private baths, air conditioning, and a baby grand piano. You can also enjoy the large common room or get an on-site massage and various spa services. There are also packages or cooking parties, murder mystery dinners, and romantic weekends to make it perfect for couples. There is always a made-to-order hot breakfast in the morning and cookies, as well as soft drinks throughout the day. Breakfast comes with fresh cut fruit, Mr. Mike’s Home-Made Jam, coffee, tea, and orange juice. Rooms start at $149. Shanty Creek Resorts is actually made up of three different villages: Schuss, Cedar River, and Summit. Summit Village has 183 rooms, pools, fitness center with a spa, restaurant, and more. Schuss Village focuses on winter getaways with condos designed to be ski-in and ski-out. Cedar River Village also has ski-in/ski-out condos, as well as suites of varying sizes. All rooms come with basic amenities such as refrigerators, coffee makers, and microwaves. Others have sitting areas, full kitchens, balconies, fireplaces, Jacuzzis, and more. The on-site spa offers an incredible range of services, such as massages, wraps, combination therapy, and exfoliation treatments. Alternatively, you may spend some time in the fitness center with its exercise equipment, pools, dry sauna, whirlpool, and steam room. Spend some time outdoors with golf, junior golf, disc golf, lawn games, soccer, volleyball, basketball, bike rentals, or movies. During the winter you can ski, snowboard and snowshoe. The River Bistro has pub games, sandwiches, breakfast, and more; the Lakeview Restaurant offers majestic sunsets and an eclectic menu with homemade desserts; Ivan’s Cafe is perfect for a meal or snack while skiing. 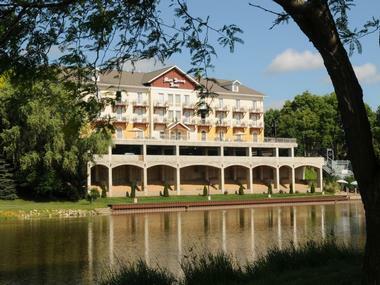 Just two blocks from Lake Superior, Minnetonka Resort is a historic resort with natural surroundings, a great location, and perfect accommodations for couples or families. Guests can stay in deluxe motel rooms, but for the most privacy for a romantic getaway, opt for a one-bedroom cottage, with larger cottages available that can house up to 8 people. You can select a cottage with a kitchenette, living/dining area, and an outside deck. When you stay at Minnetonka Resort, you can get a free tour of the Astor House Museum where you will find rare and unique artifacts from around Keweenaw as well as an antique shop. Also on the main grounds is the Spirit of the North Wellness Center for workshops, lectures, wellness treatments, massages, yoga, and more. Visitors can also go hiking, mountain biking, golfing, fishing, swimming, buy souvenirs at the Thunderbird gift shop, or simply explore the Keweenaw Peninsula. There are numerous restaurants a short walk away. Rooms start at $80 per night. The Inn on Ferry Street is divided into multiple buildings, including four restored Victorian mansions and two carriage houses for a vacation in a period setting that transports you back in time. There are a total of 40 guest rooms available, each of which has its own floor plan, furnishings, fabric, color scheme, and art. All rooms come with free Wi-Fi, an iron, hair dryer, spa bath essentials, and private bathroom, while many also come with a whirlpool bath for relaxation. With direct access to the dock, relaxing green spaces, and a beautiful building, the Island House Hotel is perfect for romantic getaways to Mackinac Island. This beautiful hotel has been in business since 1832. 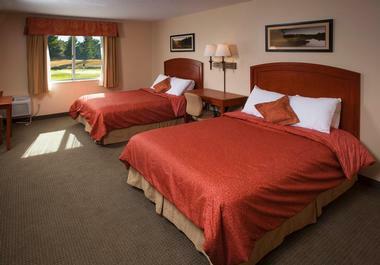 There are four room styles to choose from: Traditional, Deluxe, King, and Suites. Many are available with king size beds or have beautiful views of the water. The Apple Tree Inn takes Victorian architecture and combines it with modern amenities to offer a relaxing and romantic destination for leisure. There are numerous types of rooms available, but couples can book one of the Jacuzzi suites with a spa. These fit two people and come with a king size bed. Guests can take advantage of the brand new fitness center, hot tub, heated indoor pool, or guest laundry room. There is a cozy parlor with a fireplace for romantic evenings. There is always tea and gourmet coffee available and guests receive a complimentary deluxe continental breakfast with a gourmet waffle bar. Couples should consider the Romance Package with a limo ride to and from dinner, the Jacuzzi suite, rose petals, candles, and chocolates for an optimal experience. Rooms start at $130. The Lake Shore Resort is true to its name with its own private sandy beach, making it a perfect destination for a romantic walk along the beach at sunset. This hotel is geared towards adults looking for relaxing or romantic vacations, so most rooms have a single queen or king bed. 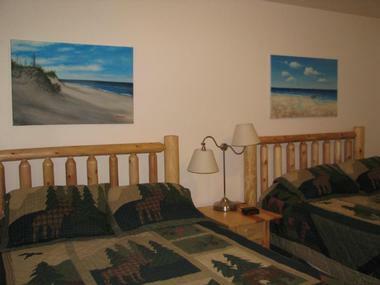 There are 30 rooms total, each with James Brandess art, air conditioning, cable TV, coffeemakers, refrigerators, and large windows to give you picturesque views of Lake Michigan. The grounds of the resort are professionally landscaped and in addition to the private beach, guests can have access to a pool, nature trails and wooded surroundings. View ducks on the lake, sit next to sunset view fire pits, and relax in complimentary chaise chairs on the beach. Guests enjoy a continental breakfast that is served at the pergola for Lake Michigan views. For other meals, take advantage of the in-room refrigerator or take a short walk to the numerous restaurants in Saugatuck - Douglas. With pine trees surrounding it on all sides, Manistee National Golf & Resort is the perfect getaway for couples with a love for golf. 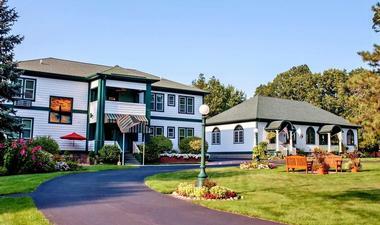 There are 42 rooms in the inn with standard rooms as well as suites, located right between the Cutters’ Ridge and Canthooke Valley golf courses. All rooms have been recently upgraded with modern amenities and comfortable features. Guests have access to an indoor whirlpool, pool, hotel lounge, an outdoor patio, a fire pit, a horseshoe pit, and an indoor tanning bed. Each of the two golf courses are par-71 with unique challenges and possess the ability to appeal to golfers of all levels. You can take golf lessons from PGA professionals. When it comes time for dinner, guests have two choices; the Wanagan Grille has steak, seafood, and more. CJ’s Lounge at the Inn is perfect for a drink, whether it is wine, beer, or mixed drinks. It also has a pool table and large screen TV. The National House Inn Bed & Breakfast in Marshall has been providing hospitality and comfort for 170 years and gives visitors picturesque views of Fountain Circle. 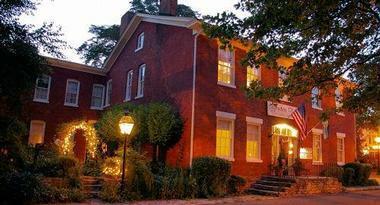 The inn has 16 rooms, each of which has unique appointments hinting at the era when the hotel first opened. Some also have sitting rooms, electric fireplaces, chests, armoires, or canopy beds, while all have at least some antique furnishings. Within the inn are three parlors, perfect for relaxing, chatting or getting a bite to eat. The downstairs entryway features a brick and beam open-hearth fireplace and there is an upstairs parlor with handcrafted cabinets and an additional fireplace. Guest have access to the back porch, Courtyard Garden, the Tin Whistle Gift Shoppe, morning newspaper, and high speed internet. Complimentary breakfast is served in the 19th century dining room with home-cooked dishes. There is afternoon tea with sweets and freshly popped popcorn every night. Rooms start at $110. The Alger Falls Motel and Rental Cabins provides a getaway with scenic surroundings for all budgets. The 16 rooms in the motel are updated and comfortable. For more privacy, opt for one of the two Rental Cabins/Housekeeping Cottages. Every room has free wireless access, air conditioning and heating, a refrigerator, microwave, coffee pot, and queen or king size bed. The cottages have fully-equipped kitchens and a dining room table. You will also find a recreation room with coin laundry to keep packing to a minimum, and a pool table. There is no on-site restaurant, but staying in a cottage lets you prepare all of your own meals. You can head out into Munising for access to several restaurants. The motel offers access to numerous outdoor activities such as hiking, fishing, boating, boat tours, snowmobiling, ice fishing, and skiing. Visit nearby attractions such as waterfalls, lighthouses, shipwrecks, Pictured Rocks, and the Hiawatha National Forest and Grand Island National Recreation Area. If you are looking for romantic getaways in Michigan in a cabin, this is an inexpensive choice. Cabins start at $68. As it is just a quick block away from Lake Michigan, Victoria Resort Bed & Breakfast is able to provide guests with easy access to the water and gorgeous views. There are a wide range of rooms available with modest accommodations or spacious rooms containing whirlpools and fireplaces, perfect for a special trip. You can rent a cottage that comfortably holds between two and six people for more privacy, a full kitchen, fireplace, whirlpool tub, screened in deck, charcoal grills, and picnic tables. Other facilities include basketball and tennis courts, outdoor pool, bike rentals, and of course Lake Michigan. All accommodations include a full homemade breakfast, featuring Apple Baked French Toast, Sausage and Egg Souffle, homemade breads, quiche, fresh fruit, muffins and cereal. Couples visiting in the winter should consider a Getaway Package which includes a massage or a voucher towards dinner, along with a room with a fireplace and whirlpool. Rooms start at $85. Yelton Manor Bed and Breakfast is perfect for couples looking for easy access to romantic starlit nights, sunsets along the beach, and lazy days. 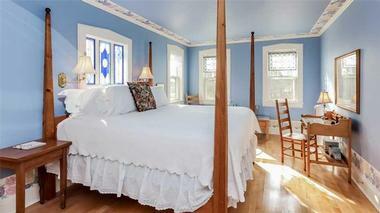 There are six rooms in the Manor Guest House, which is designed for a more private experience as a couple. The Manor has eleven rooms and offers a more social experience typical of B&Bs, but with several romantic rooms such as the Rose Honeymoon Suite and the Iris Anniversary Suite. Both buildings include numerous common areas, with the Guest House offering secluded nooks, a front parlor, and a sunny porch. The Manor is the inn’s social hub with the inn keep’s office, a few cozy nooks, and access to meals and snacks. Breakfast is included with a stay and there is also a popcorn bar and treat table. Every afternoon sees a range of beach snacks and fresh popcorn, fresh fruit, candies, and triple chocolate brownies available all day. Rooms start at $205. The Old Harbor Inn gives romantic panoramic views along the boardwalk, easy access to the sandy beach, and is only a quick walk to downtown South Haven for shops, restaurants, and more. The inn is made up of four buildings connected by a boardwalk, offering a total of 45 rooms, each of which is unique with distinct amenities and sleeping arrangements. 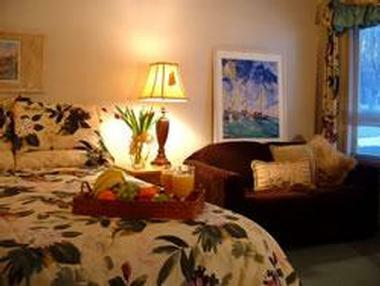 Couples should consider a Deluxe Room for luxurious linens, down comforters, a kitchenette, a Jacuzzi and a fireplace. 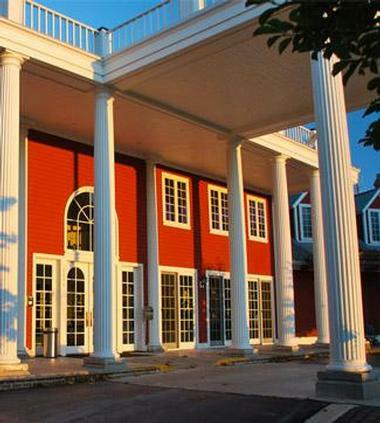 All guests have access to the inn’s 300 ft boardwalk looking over the Black River and the indoor pool. The boardwalk is perfect for watching the sunset as a couple while sipping a drink. For a meal, just take a quick walk to downtown South Haven and enjoy a bite at one of the many restaurants with a view. South Haven is also home to numerous wineries, cider mills, galleries, and museums. Rooms start at $169. 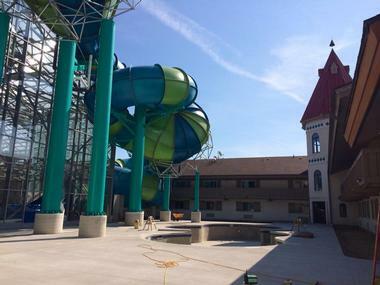 The biggest attraction at Zehnder’s is the 50,000 square foot water park with multiple slides, a lazy river and whirl hot tub. There are a total of 178 deluxe accommodations, including rooms with a view of the waterpark. The rooms include waterpark passes, a flat screen TV, microwave, coffee maker, fridge, hair dryer, and ironing board. In addition to free Wi-Fi throughout, there is an arcade covering 2,000 square feet with 40 games and a fitness center open 24/7. Thanks to the complimentary shuttle, you don’t have to worry about locating or arriving late to the Fortress golf course or Zehnder’s restaurant. The Elf Hollow Cafe serves a full breakfast buffet and contains a bar and gourmet coffee station, the second of which you will also find at the Mushroom Grille. You can also get a snack at the Waterpark Snack Window anytime you choose. Rooms start at $149. Black Star Farms is an agricultural destination, with access to the winery, hillside vineyards, pastures and barns, and luxurious guest rooms. There are ten guest rooms to choose from, each of which has a private bath and a complimentary bottle of Red House wine, Aveda toiletries and satellite TV. Some rooms feature spa tubs and/or fireplaces. The inn contains several sunning decks as well as a sauna/spa room that can be reserved for private use or for massages. Stop by the library for puzzles, a game table, magazines, and books. The inn covers 160 acres of land with wooded trails, orchards, and vineyards as well as stables. There is an on-site tasting room as well as the Leelanau Cheese Company creamery. Breakfast is included and features fresh fruit, juice, homemade granola and baked goods, a hot dish, locally roasted coffee, and tea. You also get access to hors d’oeuvre and wine before dinner in the Pegasus Bar, and afternoon snacks. There are several dinner series to pick from, including the Harvest Dinner Series and Black Star Farms Tone to Table Dinner Series, if you visit during these events. Rooms start at $225. Created by Lutherans in 1845, Frankenmuth is a charming European-looking city with lovingly preserved Bavarian architecture, culture and lifestyle. Start your exploration at the Frankenmuth Historical Museum where you can learn more about the city’s heritage and history through artifacts, hands-on exhibits and presentations. Frankenmuth River Place Shops on the banks of the Cass River are designed to recreate an old-fashioned German/Bavarian Village and offer not only unique shops, but also a lot of activities for the whole family such as the Cass River Colonial Encampment. Kids will love Grandpa Tiny's Farm where they can play with farm animals and ride a hay wagon through this century-old working farm. Frankenmuth Lager Mill is a beer shop and museum that showcases one of the city’s oldest traditions – brewing a good German beer. Known as the ”tree town” for its ancient bur oaks, Ann Arbor is well known as home of the University of Michigan, its rich cultural life and great restaurants. The University of Michigan Museum of Art is one of the biggest university art museums in the country with more than 19,000 works of art. The Ann Arbor Hands-On Museum found a great way to make learning about science, engineering, technology, art and math really cool – through hands-on experience, workshops and exploration. Sports fans should not miss the visit to the Michigan Stadium, the largest stadium in the United States and the second largest in the world. Matthaei Botanical Gardens and Nichols Arboretum are lovely, restful places to spend some time unwinding among the blooming flower beds and trails winding through display gardens such as the Gaffield Children’s Garden. There is never enough time to see everything Grand Rapids has to offer. The Frederik Meijer Gardens & Sculpture Park will appeal to both nature lovers and art fans – 300 major works of art are on display among five indoor themed gardens and spectacular outdoor four-season gardens. The Grand Rapids Public Museum, established in 1854, is a natural history museum that showcases the spirit of West Michigan. You do not have to know much about architecture to appreciate the timeless beauty of Frank Lloyd Wright's Meyer May House. Children will love natural habitats of the John Ball Zoo that are home to more than 1,100 animals. Try to catch a performance of the renowned the Grand Rapids Symphony and let the kids go wild at the Grand Rapids Children's Museum where playing and learning happen at the same time. Detroit is curious mixture of industry, art and relaxing outdoors. Stroll along the Detroit Riverfront, the hub of activities along the river where you can hike, bike, play, practice yoga or sit on the bench and people-watch. Baseball fans can enjoy a tour of the Comerica Park, the home of the Detroit Tigers Major League Baseball Team. A visit to the Motor City would not be complete without checking out the Ford Piquette Avenue Plant, the first Ford Motor Company factory. Let Show Me Detroit Tours take you to the little-known city spots, attractions, nooks and crannies and show you Detroit as only knowledgeable locals can. The Michigan Science Center encourages learning about science in a hands-on, fun and creative way. Visiting Holland can be confusing: you are in Holland, there are tulips and windmills everywhere, but this charming European-looking town is in the heart of Michigan. Holland State Park is located on two lakes - Lake Michigan and Lake Macatawa, and its wonderful sandy beach is popular with locals and visitors with a range of activities, from sand-castle building to surfing and beach volleyball. Visit scenic Windmill Island Gardens to see the 251-year-old windmill De Zwaan brought all the way from the Netherlands in 1964. Stroll through the quaint historic streets of the Nelis’ Dutch Village, a replica of the 1800’s Dutch village, with authentic architecture and lot of fun activities. Walking along the Mount Pisgah Dune Boardwalk is great opportunity to enjoy spectacular views of Lake Macatawa, Lake Michigan, the marinas and the Big Red lighthouse. Find more Things to See & Do in Holland, Michigan. It is hard to imagine a beach town so far north, but Grand Haven has it all: magnificent beaches, a colorful boardwalk and all the fun that goes with it. Stroll along the 1.5 mile boardwalk from downtown Grand Haven to Lake Michigan. A lighted catwalk connects the boardwalk to the two bright red historic lighthouses built in 1839. On the other side of the boardwalk is the 48-acre Grand Haven State Park, with the most beautiful Lake Michigan sandy shore where you can build sand castles in the summer or skate in the winter. Visit the Tri-Cities Historical Museum that depicts the people and events that shaped the history of Grand Haven. Enjoy the 20-minutes long Grand Haven Musical Fountain water and light show with music of all kinds. Never been to Switzerland? Step into downtown Gaylord and you will know how an old-fashioned Swiss village looks. Small and quaint, Gaylord is nature lovers’ paradise. Visit the Call of the Wild Bavarian Falls Park and answer call of the wild. This unique museum tells the story of Northern Michigan’s wild animals, the people who trapped them, their history and their legends. Hike through the Louis M. Groen Nature Preserve, a former lumber camp and a great spot for cross country skiing in the winter. Pay your respects to the Pontresina Stone, a piece of granite that symbolizes friendship between the people of Gaylord and those of Pontresina in Switzerland. Take the kids to see the magnificent elks at the Aspen Park or Pigeon River State Forest. Visit the Gaylord Car Factory where the Gaylord Motor Company or GMC assembled its first car in 1910. Join the walking history tour of downtown Gaylord and learn more about the history and people that made Gaylord what it is today. St. Ignace is the gateway to northern Michigan, a small town rich in the history of native peoples who lived in the area for thousands of years. Visit the Museum of Ojibwa Culture to learn about the history and culture of the upper Great Lakes. Climb the 200’ tall Castle Rock and take in spectacular views of St. Ignace and the surrounding areas. Take the Glass Bottom Boat Shipwreck Tour and see what is hiding at the bottom of Lake Michigan. Take the kids to the Garlyn Zoo and play with wild and not so wild animals. Take the Lighthouse Cruise to see eight lighthouses strategically placed along the Straits of Mackinac. Mackinac Island is four-square miles of pure fun. Once your ferry arrives, you will be transported back in time. Take a narrated horse carriage tour through the quaint historic streets which buzz with activity. Check out Arch Rock, a magnificent limestone formation, where you will have spectacular views of Lake Huron. Visit Wings of Mackinac, a beautiful butterfly conservatory where you can see colorful butterflies in all of their life stages. Have a cocktail at the Grand Hotel, built in 1887, on the longest porch in the world overlooking the Straits of Mackinac. Take the kids to the Mackinac State Historic Parks where they can fire a canon and learn about the history of Fort Mackinac and Fort Holms. Taste the best fudge in the world at Murdick’s Fudge store and watch masters make more than 15 flavors of Mackinac’s most important export. Mission Point Resort is a popular place to stay on Mackinac Island, especially during the summer season. Traverse City is small, picturesque town on Traverse Grand Bay, famous for its cherries, wineries and spectacular nature. Sleeping Bear Dunes National Lakeshore will take your breath away with 64 miles of beaches, hiking trails and spectacular wilderness. Stroll through the Village at Grand Traverse Commons with its painstakingly restored historic buildings or have a picnic on the lawn. Take the kids to the Great Lakes Children's Museum, where they are allowed to touch everything. Visit Grand Traverse Lighthouse Museum on Leelanau Peninsula, which is located in one of the oldest working lighthouses on the Great Lakes,. Explore the Eyaawing Museum & Cultural Center and learn about the art, history and culture of the Chippewa and Grand Traverse Band of Ottawa Indians.